Good news! James Reid and Nadine Lustre a.k.a. 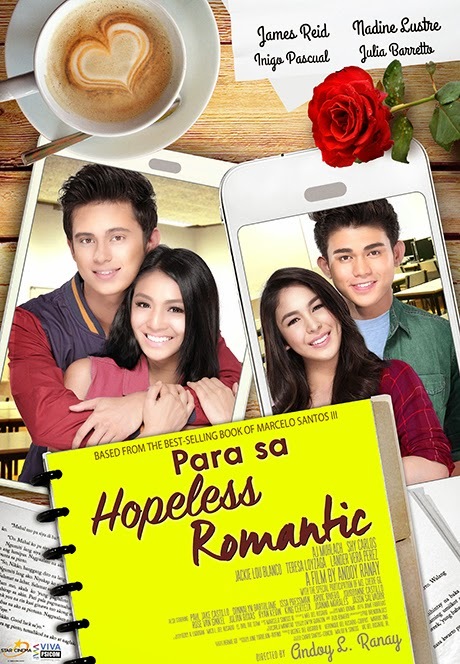 Jadine will again star on a new romantic movie Para sa Hopeless Romantic. Finally, Jadine fans, the long wait has paid off as their upcoming movie is getting closer and closer so hold on tight. To those who doesn’t know, Jadine has already made two romantic blockbuster movies namely Ang Diary ng Panget and Talk Back and You’re Dead which are both based on wattpad books of the same title. Well….. Their upcoming movie is still based on a book but is not from wattpad anymore. It is actually one of the best-selling romantic novel in the country. The book with the same title is written by Marcelo Satos III. Moving on, the movie will be directed by Andoy Ranay same director of the two films mentioned above. nd AJ Mulach. The movie is set to air on May 13, 2015.